This award recognizes an individual who demonstrated leadership in development and implementation of effective extension programs as an individual, team member or coordinator with evidence of productivity, visibility and impact of extension programs in Nebraska and beyond. Jhala has been at Nebraska since 2012. His research focuses on the biology, pollen-mediated gene flow and management of herbicide-resistant weeds. He has developed an outstanding weed science extension program that reaches several thousand clientele every year to solve weed-related problems in corn, soybean, sorghum and popcorn in Nebraska. As past coordinator of the Crop Production Clinics, Jhala provided an estimated 1,800 attendees annually with one of the largest extension programs in Nebraska Extension system. He currently organizes the Corn and Soybean Weed Management Field Day. Jhala provides cutting-edge information at Extension events by demonstrating trials of new herbicides, multiple herbicide-resistant crops and how to manage herbicide-resistant weeds. These events, attended by growers, crop consultants, industry representatives and Nebraska’s commodity board members, provide unbiased information about weed control. Publication credits for Jhala include 11 book chapters, 90 papers published in peer-reviewed journals, 96 extension articles and 10 peer-reviewed extension articles. He is also serving as an associate editor of Weed Technology, a peer reviewed scientific publication of Weed Science Society of America. Jhala received the Distinguished Achievement Young Weed Scientist Award by the North Central Weed Science Society in 2016 and Early Career Outstanding Weed Scientist Award by the Weed Science Society of America in 2017. Jhala's research and extension program is at agronomy.unl.edu/jhala. 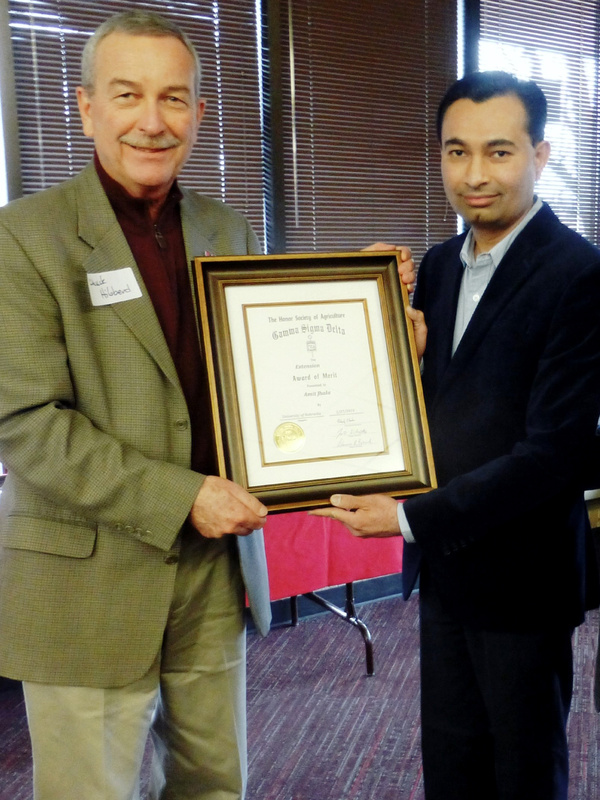 Chuck Hibberd presenting The Honor Society of Agriculture Gamma Sigma Delta Extension Award of Merit to Amit Jhala.